This article views crisis in the light of trust. From this perspective, crisis is a natural psychological reaction to a situation in which humans do not feel confident to act because they do not know what to expect from other people in the community. Theoretically, it can be a permanent state of uncertainty (Luhmann 1979: 4); however, a crisis is usually caused by a change, by a sudden realization that the norms and meaning-systems that they expected others to follow are actually not shared by others. In a crisis situation people are confused about the rules of society, do not know whom they can trust and do not dare to act because they cannot foresee the consequences. The complexity is overwhelming. They have gotten a wake-up-call and need time to learn the new rules of the game before they again feel confident to act. The 2000s have been framed in terms of crisis. A major event in the start of the decade was the terrorist attack in the USA on September 11, 2001, which led to explicit distrust in foreigners around the world, to the war on terror, and to different systems of social control. Other crises followed in that same decade, including the so-called economic crisis, followed by distrust in financial institutions as well as in political leaders (Glassman 2014: 23). The World Economic Forum perceives trust or lack of trust as “a crucial factor in how risks may manifest themselves” in the world (2012: 49). Banks operate the economy’s most important payment and settlement systems. It would be difficult for a market-based economy to carry out its essential functions if buyers of goods and services were unable to settle their transactions by debiting their bank accounts (or borrowing on bank credit lines) in favor of the bank accounts of sellers (2012: 40). Four years ago the media reputation of the banking industry was only worse than the tobacco industry. Since then, the picture for the financial sector hasn’t gotten better, but worse. Now the banking industry is rated even more negatively in the media than the nuclear energy sector (Kolmer, Schatz and Vollbracht 2012: 7). The suspicion that our banks lie to us, cheat us with interest and fees, or simply go broke in a moment, is a widespread phenomenon that banks have to fight with real improvements behind the words, if they want to win public confidence back (2013, translated from Danish by Google). The 2010s have been characterized by a renewed longing for trust in fellow citizens, foreigners and institutions. In that connection, experts from many fields have discussed how to repair the general image of banks (e.g. Bower, Leonard & Paine 2011; Duffie 2012; Kolmer et al 2012; YouGov-Cambridge 2013). To illustrate the connection among normative expectations, trust and crisis, I will use a constructed case in which a man called Petersen seeks advice in his bank regarding investment of his pension saving. Bank advisor Miller strongly encourages Petersen to buy stocks in the bank, and Petersen follows the advice. However, shortly after the purchase of the stocks, the bank goes broke, and Petersen loses his savings. The case is constructed on bases of testimonies from many shareholders who said that they had been strongly advised by their bank advisor to buy stocks in the Roskilde Bank, Denmark, in days just before the bank collapsed in 2008 (Ritzau 2013). Some of these people later received compensation from the Danish state due to an extraordinary aggressive marketing campaign combined with lack of relevant, trustworthy information in the communication with customers (Forbrugerombudsmanden 2013). In the following I will first describe three social phenomena, norms, trust/distrust and crisis response in relation to the case, and then combine these three concepts in a theoretical model that shows how they are linked and what their function is in relation to one another. For this analysis I will refer to Alf Ross’ essay Directive and Norms (1967) and Niklas Luhmann’s essay Trust (1968; 1979). Even though the two essays were written half a century ago, they deal at a very fundamental level with some concepts that seem relevant for our understanding of the present crisis. As it is evident from the publication dates, the two European professors contributed to the academic debate with these essays at approximately the same time. This was a time when many scholars were interested in topics related to complexity (Knudsen 2010; Luhmann 1979: 5). Ross and Luhmann both had a background in law and were interested in understanding the role of social phenomena such as trust and norms. Both drew in that connection on theories from the field of sociology. Alf Ross analyzed in this essay “the concepts ‘directive’ and ‘norm’ as they function in social science, especially within the legal theory and (…) the study of conventional morality, folkways and related topics” (Ross 1967: 8), while Luhmann analyzed trust and distrust in its many forms, including interpersonal and institutional trust. Ross (1899-1979) was a professor of international law at Copenhagen University, Denmark, and Luhmann (1927-98) a professor of sociology at University of Bielefeld, Germany. They have had enormous influence on European intellectual thinking throughout half a century, but they belonged to different academic communities, and despite their influence and similarities, their theories are usually not combined. A third important scholar for this paper is Arthur G. Neal, emeritus distinguished professor in sociology at Bowling Green State University in Ohio, USA. His newest book (2014) analyzes the phenomenon of values, but he has previously analyzed other social psychological phenomena. For this paper I will draw on insights into the phenomenon of crisis reactions from his book National Trauma & Collective Memories (1998). In the constructed case for this paper, Petersen has read about different pension-saving plans on websites belonging to financial institutions. Since each of them sounds appealing, he realizes that he needs advice from an expert. So Petersen makes a visit to bank advisor Miller. It would not make sense to ask advice on important matters like pension savings from persons whom we expect to cheat or be uninformed. It is exactly because Petersen “has reason to believe that these two conditions are satisfied he is willing to accept the proposition which [Miller] presents to him” (Ross 1967: 22). According to Ross, advisors such as medical doctors, lawyers and good friends are generally expected to provide directives that will best serve the advisees’ interests (Ross 1967: 44). However, from the bank advisor’s perspective, other specific commercial norms might trump these general social norms. For example, the advisor may have been trained to sell the bank’s products and thus serve the interests of his employer rather than the interests of the customer. The fact that he has been introduced to customers like Petersen as “adviser” instead of “salesman” is just part of a persuasion logic. In other words, Petersen and Miller have different perceptions of the system of norms involved. In our case, the interpretation of the situation is obviously very important. We must evaluate if the meeting between Miller and Petersen is a sales event where Miller is expected to try to sell the bank’s financial products or an advisory meeting where Petersen seeks advice from Miller in his capacity as financial expert. It might not help to be explicit about it. Many sales people try to convince customers that they are there to “help” them. Customers are expected to be able to interpret the situation correctly based on their cultural knowledge. Ross perceives convention as a “social phenomenon” that has “over-individual existence similar to that of the law” (Ross 1967: 52) among people in certain communities and social groups; however, one group may disagree with another group about what is seen as morally acceptable. In our case, Petersen and Miller may not agree on the conventions regarding bank advisors. In general, norms cannot be evaluated as true or false; we can only say that they exist and when they are applied (Ross 1967: 102). Whatever we may think about the norms applied by Miller and Petersen, it will be a moral reasoning based on our own moral standards and they are not universal. According to Ross, morality depends on a foundation of values and ideas “which one approves immediately and takes as directly binding” (Ross 1967: 58) The individual, not authority, decides whether the norms are valid and implies obligations, even though cultural norms, value, customs and conventions are originally learned through social interaction, including childhood education (Ross 1967: 67). Moral values are often “organized in a hierarchy, so that values and principles at one level may be derived from those at a higher level” (Ross 1967: 67). Such systems have built-in criteria for what norms are justified (Ross 1967: 49). People apply their own moral system when judging the behavior of others as well as their own (Ross 1967: 66). In our context it could mean that Miller with his commercial values perceives Petersen as being easy to persuade, while Petersen – believing that advice is guided by compassionate values – perceive the friendly, smiling Miller as a person who honestly is trying to help him. In social science, according to Ross, when talking about “existence of a norm it is understood that by this we refer to a social state of affairs – i.e. to conditions which although changing, are of relative permanence” (Ross 1967: 80). A norm is a “directive which corresponds to certain social facts” (Ross 1967: 93), which means that it is “generally followed by members of the society” (Ross 1967: 93) or smaller social groups (Ross 1967:94) and that people feel it “binding (valid)” (Ross 1967: 93). That a norm is binding is, in Ross’ view, a mental and psychological experience. A person who is in a situation where a certain norm is expected will feel “a special prompting or impulse to act according to the pattern. This impulse does not appear as a manifestation of his need and interests; it may indeed conflict with these” (Ross 1967: 85). He feels that he has a duty, that it is the right thing to do, that he ought to do it. People observing him have an expectation that he will follow the norms, and if he does not, they may feel negatively about his behavior. Ross discusses with some other scholars if the negative reaction from society is the strongest reason for conformity; however, as Ross writes: “To some extent the two views lead to the same results” (Ross 1967: 87). The experience of validity of a norm has a lot to do with “psychological phenomena” (Ross 1967: 86) experienced by the people involved. If trust did not exist or were not justified, no communication would be possible. (…)The point is that even lying, the misleading of people through false information, is possible only on the same conditions. Lies exist only as parasites on truth; they are conceivable only as exceptions which depend on the norm they violate (Ross 1967: 23). In our case, it does make a difference if Miller is guided by internal prompting or fear of societal punishment. He may in fact not expect any punishment in case he cheats Petersen in a business negotiation. In a professional discussion with his colleagues he can easily argue that Petersen was too naïve, and he might even earn a bonus for every new customer like Petersen. However, if he experiences Petersen as a vulnerable man trusting him to give honest advice, then he may feel a prompting to act compassionate in accordance with moral norms in the society, even though he may in that case lose a reward from his employer and be ridiculed by his colleagues. Norms describe how to act in different types of situations, and since they are generally shared by people in a society, they are mirrored in our expectations to other peoples’ behavior in certain situations (Ross 1967: 107). As humans, we expect that other people in our society will behave in accordance with general accepted norms and meanings systems (Poggi 1979: xiii-xiv; Ross 1967: 78-81). We hardly notice people, who on a daily basis behave in accordance with the general norms because they just do as expected, but if they violate the norms – and if no legal instruments are used – then the sanctions are social forms of nonviolent disapproval. Norms are independent of how any individual reacts as long as it is “generally effective among members of a social group” (Ross 1967: 99). Some norms are universal so that they apply to all of us, while other norms are specific so that they apply to certain people in certain situations only, e.g., during a fire emergency workers are expected to move toward the fire while the rest of us are expected to move away. Norms cannot be determined from behavior alone – the behavior must be analyzed in the light of the meaning the person ascribes to it and the mental evaluation involved. We will now from a trust perspective analyze the situation where Petersen discussed the options with the bank advisor Miller. He would be prey to a vague sense of dread, to paralyzing fears. (…) Anything and everything would be possible. Such abrupt confrontation with the complexity of the world at its most extreme is beyond human endurance (1979: 4). Since other people have their own firsthand access to the world and can experience things differently, they may consequently be a source of profound insecurity for me (1979: 6). This insecurity about what to expect from other people may be more manageable with increased knowledge about the people involved and their norms (Luhmann 1979: 19, 33), but risk is an existential reality that will never disappear. The world is therefore constituted as the universal horizon of experience, which must be presupposed in every movement and can never be departed from. The manner in which experience is led to organized meaning and the world so as to make the complex conditions of existence comprehensible is an operation carried out intersubjectively (1979: 18, referring to Husserl). Our expectations regarding the future are based on our experiences, so in that way our experiences are the link that connects history to the future. This is true both at society level and at a personal level. If Petersen previously had experienced bank advisors as helpful, had heard from others that they received good advice or had read in advertisements that his bank advisor was there to help, then this information has contributed to his expectations regarding the service he would receive from Miller. 1. Specific distrust: Miller is not trustworthy but other bank advisors are, so Petersen changes banks. 2. General distrust: Bank advisors are not trustworthy, so Petersen will not ask bank advisors for help with his investments in the future. Petersen realized later that Miller had behaved differently from what he expected, and that happens to all of us on a regular basis. If such an incident can be perceived as an isolated case and if it has limited impact on us, then we just change our expectations about the people involved. However, if the violation of our expectations has a huge impact and we do not know what to expect next, then we experience a crisis. During the time that is characterized by crisis reactions we judge whom to trust and what to expect in the future. The crisis creates room for evaluation and new orientation. I will now turn to the description of how people experience the period where the judgment has not been made and people don’t know what to expect. A crisis is usually perceived as a very unpleasant state of affair, but from my analytical point of view it is a natural reaction to unexpected violation of norms. If a person loses trust in his or her own expectations the consequence is a reaction that can best be termed crises. For example, many people reacted with crisis symptoms when they realized that they had lost their pension savings for reasons related to the financial crisis. In connection with the so-called Enron Scandal, USA, in the 2000s, republican blogger and activist Ron Branson wrote: “There is little more upsetting than to discover that you have been scammed for your entire life-savings and for everything you owned” (2007). Unfortunately, Enron was not the only case where pension savers lost money. There have been revealed so many cases of mismanagement of pension funds and investments that it has contributed to a perception of a pension crisis (e.g., Siedle 2013). [A]n ongoing activity has been interrupted by an adverse happening that is unexpected, painful, extraordinary, and shocking (…) Previous feelings of safety and security are replaced by perceptions of danger, chaos, and a crisis of meaning (1998: 3). In most cases we experience traumas as something that only affects us as individuals, as a personal loss, but some traumas are shared simultaneously by large groups of people, as when thousands lost savings in connection with the collapse of the Lehman Brothers in 2008 (Wikipedia 2014), and millions of other citizens instantly realized that they had trusted a huge financial institution which was actually not trustworthy. Such a trauma is experienced as “an assault on social life as it is known and understood” (Neal 1998: 4). Typical reactions include feelings of shock, disbelief, helplessness, numbness, anger, fear, vulnerability, and detachment. According to Neal, “Chaos prevails, and people become uncertain about what they should or ought to believe” (1998: 4). The trauma make them realize that their “own sense of morality and decency is not shared by others.” (Neal 1998: 6). As banks began to fail with increasing frequency and as levels of unemployment escalated (…) economic hardship took its toll on all major sectors of the economy. Capitalism was in a state of crisis, and the free enterprise system failed to work. Economic hardships translated into fear, vulnerability, and a sense of despair (Neal 1998: 8). People see themselves as moving into uncharted territory. The central hopes and aspirations of personal lives are temporarily put on hold and replaced by the darkest of fear and anxieties (Neal 1998: 5). An extraordinary event becomes a national trauma under circumstances in which the social system is disrupted to such a magnitude that it commands the attention of all major subgroups of the population. Even those who are usually apathetic and indifferent to national affairs are drawn into the public arena to discuss and debate. The social fabric is under attack and people pay attention because the consequences appear to be so great that they cannot be ignored (Neal 1998: 9-10). Because expectations have been violated, people in crisis have lost confidence in their previous evaluations of which people and institutions they can trust. It is a crucial ability for survival in society, and in order to master that skill in the future people are especially interested in understanding how “human intentions, decisions, and actions are linked in shaping the course of events” (Neal 1998: 13-14). In his 1998 book Neal analyzed nine national traumas that had serious impact on the life in the USA. The global financial crisis in the 2000s fits the criteria for this type of collective trauma because it “had a major impact on the institutional structure of society and fed into overriding forms of collective fear and anxiety” (Neal 1998: x). I will now combine the three concepts — norms, trust, and crisis — into one theoretical model that illustrates the relationship among the three phenomena. While I claim full authorship for combining the three concepts in the model, the structure of the model is heavily inspired by figures in Morten Knudsen’s article Surprised by Method – Functional Method and System Theory (2010) that discusses Luhmann’s work and methodology. Given this approach, the process of research in functional analysis is open to all kinds of possibilities (…) The functional compartmentalization of this unity into a problem (increase of complexity) on the one hand, and a solution (reduction of complexity) on the other, serves simply as a means to compare different kinds of solution (1979: 5,7). Trust compensates for an element of uncertainty related to other people’s behavior. If everything possible should be expected all the time, it would be difficult to do anything (2010: 20). There is not a causal relationship between a problem and possible solutions. In principle there can be many different solutions to a problem as we know from comparative studies, for example, of law in different cultures (Michaels 2006). The challenge for a scholar using this methodology is to create theories that can explain how a given phenomenon functions as a solution to a problem. The necessity of trust can be regarded as the correct and appropriate starting point for the derivation of rules of proper conduct (1979: 4). We need the concept “norm” to express the social fact, which is independent of how any individual reacts, that is generally effective among members of a social group (Ross 1967: 99). 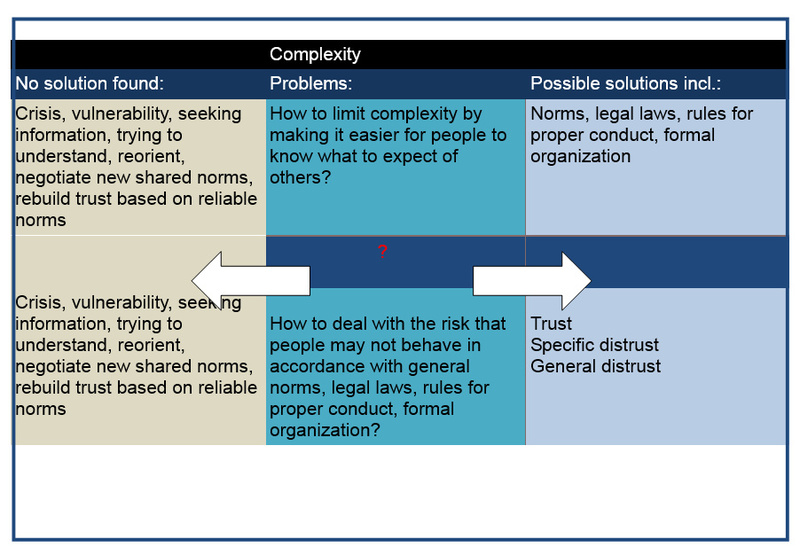 Figure 2 illustrates how norms make it easier for a person to decide whether or not to trust because the expectations can be linked to social norms for proper conduct. As shown in Figure 3, my analysis indicates that crisis is a normal and healthy reaction when one’s own expectations have been seriously violated with negative consequences and time is needed for reorientation. To continue trusting the people and institutions that have created a serious trauma is pathological. While in the crisis mode, people like Petersen can adjust their expectations to the behavior of other people, and when a crisis is shared by a collective, it is also an opportunity to reorganize social life and negotiate new standards for proper behavior. Because a crisis is a very unpleasant state, people are truly motivated to find solutions. Thus, from a functional perspective, we may consider a crisis to be one possible solution to the problem of immutability. A trauma changes the victim – whether a person or a society – forever (Neal 1998: 4). When the crisis has passed, people have changed their expectations, and this has also been the effect of the scandals related to financial institutions. If we return to our constructed case, Petersen expected Miller to help him when he came for advice. Petersen was not alone in his expectations regarding the norms of bank advisors. The outrage expressed publicly when it became obvious that bank customers had been fooled by their advisors – not only in Roskilde but in financial institutions around the world – is a clear indication of the fact that before the financial crisis many people like Petersen thought that bank advisors were serving their interests in line with general norms for professional advice. They had somehow presumed that the norms guiding relationships between customers and professional advisors, such as physicians and lawyers, also guided the relationship with bank advisors. That expectation changed. The public debate made people aware that bank advisors are salespersons guided by commercial norms, which means that Miller’s commercial norms have been accepted as the rule of the game. Petersen’s expectations of his bank advisor are now considered naïve. Using Luhmanns concepts we might even talk about pathological trust if people now trust their bank advisors to give them independent and trustworthy advice. Stories about fooled bank customers appear often in the news as part of the coverage of ongoing court cases, and they will no doubt be retold many times in the years to come because a new generation needs to understand the norms. Since people have formed new expectations regarding bank advisors, they can once again feel confidence in their own expectations. They can trust. Bower, J.L., Leonard, H. & Paine, L.S. 2011, Capitalism at Risk: Rethinking the Role of Business, Harvard Business Press Books, Boston, USA. Branson, R. 2007, March 21-last update, Victim of Enron Scandal? Court Says – Too Bad! [Homepage of J.A.I.L. News Journal], [Online]. Available: http://www.jail4judges.org/J.A.I.L._News_Journals/2007/2007-03-21.html [2014, April 3]. Duffie, D. 2012, 2012-last update, Drawing Boundaries Around and Through the Banking System published in The Financial Development Report 2012 (edited by Klaus Schwab) [Homepage of World Economic Forum], [Online]. Available: http://reports.weforum.org/financial-development-report-2012/ [2014, March 26]. Forbrugerombudsmanden 2013, December 3, 2013-last update, Erstatning på vej til mange Roskilde Bank-aktionærer [Homepage of Forbrugerombudsmanden], [Online]. Available: http://www.forbrugerombudsmanden.dk/Nyheder-fra-FO/Pressemeddelelser/Erstatning-paa-vej-til-mange-Roskilde-Bankaktionaerer?tc=BF261306197B4C528A4E939E2731D6DE [2014, March 26]. Glassman, M. 2014, Correlations: Confidence Factor. Data: OECD and Gallup, April 3 edn, Bloomberg, New York, USA. Ipsos MORI 2013, Ipsos MORI Trust Poll [Homepage of Ipsos MORI], [Online]. Available: http://www.ipsos-mori.com/Assets/Docs/Polls/Feb2013_Trust_Topline.PDF [2014, March 26]. Isidore, C. 2014, March 14-last update, FDIC sues big banks for alleged Libor manipulation [Homepage of CNN], [Online]. Available: http://money.cnn.com/2014/03/14/news/companies/fdic-libor-suit/ [2014, March 26]. Knudsen, M. 2010, September 2010-last update, Surprised by Method—Functional Method and Systems Theory [Homepage of Forum Qualitative Sozialforschung], [Online]. Available: http://www.qualitative-research.net/index.php/fqs/article/view/1556/3067 [2014, February 20]. Kolmer, C., Schatz, R. & Vollbracht, M. 2012, , Trust Meltdown IV : Finance sector craves for tobacco’s or nuclear energy’s media image [Homepage of Kommunikationsforum, media Tenor], [Online]. Available: http://www.kommunikationsforum.dk/log/multimedia/PDF%20og%20andre%20dokumenter/TrustIV_web.pdf [2014, March 26]. Luhmann, N. 1979, Trust and Power: Two works by Niklas Luhmann. With introduction by Gianfranco Poggi. John Wiley & Son, Chichester, Great Britain. Neal, A.G. 2014, Core Values in American Life, Transaction Publiser, Piscataway, NJ, USA. Neal, A.G. 1998, National Trauma & Collective Memory: Major Events in the American Century, 1st edn, M. E. Sharpe, inc, New York. Nichaels, R. 2006, “The Functional Method of Comparative Law” in The Oxford Handbook of Comparative Law, eds. M. Reimann & R. Zimmermann, Oxford University Press, Oxford, GB, pp. 339-339-382. Poggi, G. 1979, Trust and Power: Two works by Niklas Luhmann. With introduction by Gianfranco Poggi, John Wiley & Son, Chichester, Great Britain. Ritzau 2013, December 3, 2013-last update, Fakta: Sådan lokkede Roskilde Bank kunder til aktiekøb [Homepage of Information], [Online]. Available: http://www.information.dk/telegram/480725 [2014, April 12]. Ross, A. 1968, Directives and Norms, 1st edn, Routledge & Kegan, London. Siedle, E. 2013, March 20, 2013-last update, The Greatest Retirement Crisis In American History [Homepage of Forbes], [Online]. Available: http://www.forbes.com/sites/edwardsiedle/2013/03/20/the-greatest-retirement-crisis-in-american-history/print/ [2014, April 4]. Transaction 2014, , Core Values in American Life: Living with Contradictions [Homepage of Transaction], [Online]. Available: http://www.transactionpub.com/title/Core-Values-in-American-Life-978-1-4128-5394-1.html#edreviews [2014, February 24]. Vallentin, S. 2013, February 18-last update, Bankernes troværdighed i frit fald: Danske bankers dæmonomdømme kan tales væk [Homepage of Kommunikationsforum], [Online]. Available: http://www.kommunikationsforum.dk/artikler/bankernes-trovaerdighed-i-frit-fald [2014, March 26]. Wikipedia 2014, March 3, 2014-last update, Bankruptcy of Lehman Brothers [Homepage of Wikimedia Foundation, Inc.], [Online]. Available: http://en.wikipedia.org/wiki/Bankruptcy_of_Lehman_Brothers [2014, March 4]. Wood, J. & Berg, P. 2011, , Trust in Banks [Homepage of Gallup, Inc], [Online]. Available: file:///C:/Users/KMO/Downloads/Trust%20in%20Banks.pdf [2014, March 26]. World Economic Forum 2012, Insight Report: Global Risks 2012 Seventh Edition, World Economic Forum, Cologny/Geneva Switzerland. YouGov-Cambridge 2013, , Public Trust in Banking, Spring Symposium April 2013 [Homepage of Yougov], [Online]. Available: http://cdn.yougov.com/cumulus_uploads/document/ylf7gpof19/Public_Trust_in_Banking_Final.pdf [2014, March 26].